Antonia was last seen in Regent's Park walking her dog. The fast-moving story travels backwards in time. Exploration of the mystery of Antonia's fate follows twists and turns as hair-raising as the roads on the mountainous isle of Capri. Jane Huxley, detective of the human psyche, ushers readers to the astonishing ending, proving that the deepest mystery of all is that of the soul torn between desire and loyalty. Soon to be made into a motion picture. Jane Huxley is recognised as a clever and ingenious novelist. 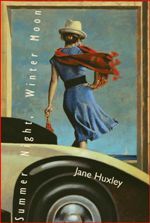 As one reviewer of her previous work called "the pampered indolence of F. Scott Fitzgerald's “The Beautiful and the Damned", Huxley once again elevates the novel to literary artwork. She is married and has 2 daughters. "This is a thrilling, cleverly constructed story of love distorted by jealously." You have to read this book....you can't put it down till the last page! I loved this book couldn't put it down! Wonderful, beautiful book; as are all the others I have read by this author! Different. Gripping. Highly recommended. Much enjoyed it. Brilliantly written. Reverse chronology. A great fast read.